When you begin an exercise program, you typically do so to improve your health. Unfortunately, being active increases your risk of injury. Running happens to be one of those great forms of exercise that carries such risk. Runners can potentially develop shin splints, stress fractures, and plantar fasciitis to name just a few possible injuries. At Dallas Podiatry Works, we want you to get in shape safely, so we are going to talk about various injuries we see and offer running tips to help prevent them from happening to you. Shin splints are a common injury for runners, especially after changing workouts too quickly to longer distances and more frequent running sessions. This injury refers to achy pain that is experienced in your lower leg along the shin bone (tibia) when the muscles around the bone sustain small tears. Shin splints are more prevalent for individuals who have flat feet or high arches. If you wake up with a sharp pain in your heel, it is possible that you have plantar fasciitis. This condition is an overuse injury that occurs in the plantar fascia, which is a thick band of tissue that runs along the bottom of your foot from the heel to your toes. When the band becomes irritated and inflamed it causes that sharp pain. When you think of a broken bone, you will likely think of a break that happens as a result of an acute, traumatic injury, but stress fractures are breaks that occur due to repetitive stress on a bone. This condition is quite common and is often attributed to overuse. Bones are often connected to other bones, but you have other types in your body called sesamoids that are connected to tendons or embedded in muscle. The easiest example to picture is your kneecap, but you also have two very small ones in the underside of each foot. When these tiny bones fracture, the painful condition is known as sesamoiditis. Choose quality running shoes that properly fit your feet and your running style. When you opt for footwear that is either too large or too tight, you run the risk of developing blisters, bunions, or toe deformities. Buy your shoes at a specialty store that caters to runners and have the professionals help. Change your running shoes at appropriate intervals. Running shoes break down over time. When you purchase them, ask the salesperson what kind of mileage they can get and how to know when they should be replaced. Progress easily into a running program. Trying to do “too much, too soon” is a recipe for disaster. 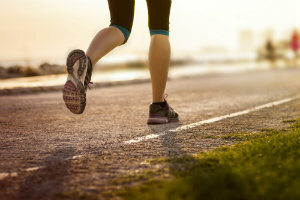 If you haven’t run before, or it’s been awhile, start by walking for four minutes for every one mile running, and gradually switch that balance. Warm up and stretch before hitting the trails or pavement. A majority of running injuries happen due to inadequate stretching. Cold, stiff muscles are more likely to get hurt, so warm up for five minutes and then stretch. Avoid common overuse injuries by mixing up your training with swimming and bicycling. This will not only help decrease the risk of those injuries, it will also contribute to your overall health. Here at Dallas Podiatry Works, we hope that these running tips help keep you safe as you work to lead a healthier life by staying active. Unfortunately, you can make injuries less likely to happen, but that never completely eliminates the possibility that they will. The good news is that we are here for you at our Dallas and Plano, TX, offices to provide exceptional care and treatment when you need it. Make an appointment to see either Dr. Joel W. Brook, Dr. David R. Northcutt, Dr. Irene Arroyo or Dr. John Baca, the leading podiatry experts in the Dallas area, by calling toll free 972.566.7474 or using our online form today.